West Ham turned in a surprising victory over a struggling Manchester United side in Premier League action today. With the win, the Hammers vault to 12th in the table and secured their first league victory over Manchester United since the final match at Upton Park. The Hammers were not passive and defensive as typically displayed against a top six club. The back line was aggressive and the scoring started early. Only five minutes in Pablo Zabaleta had a cross to Felipe Anderson, who back-heel tapped it into goal. It was the first league goal for the West Ham record signing, and got the hosts off to a strong start. 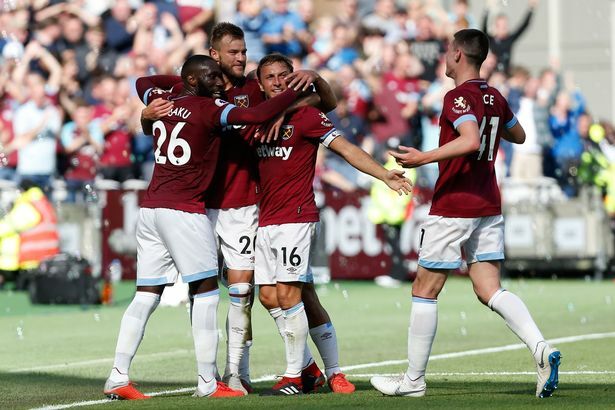 West Ham continued to threaten but didn’t find their second goal until very late in the half when Andriy Yarmolenko’s shot deflected in off Victor Lindelof, and the Hammers were able to take a sound 2-0 lead into the break. Neither team made changes at the half. It was somewhat surprising since Mourinho’s side was a very defensive XI and the only good attempt of the opening half was when Romelu Lukaku’s header struck the post. Finally, in the 57th Mourinho brought on Marcus Rashford. It was Rashford’s back heel from a Shaw corner that allowed the Red Devils to claw back into the match at 2-1. But looking to close the door on the match and secure all three points, Mark Noble, with great awareness, found a streaking Marko Arnautovic in the middle channel of the pitch, just as United’s defenders were a bit out of shape. Arnie found himself in the penalty area one-on-one against De Gea, and he struck to the right side of the net, low and away, to give West Ham the final 3-1 advantage. For Arnautouvic, it was his fourth Premier League goal, and he showed great durability coming back from injury to contribute to the victory. Despite the poor start to the 2018-19 campaign, Manuel Pellegrini seems to have his club believing and “buying into” his system of play. Once again, Mark Noble has proven to be such a great leader. Each season it’s tempting to suspect his contributions are behind him, and each season he comes on makes his side better. With a favorable schedule ahead, West Ham has the talent to make a good run to the top half of the table. If the team stays healthy and the players continue to show good spirit, this season might turn out to match the expectations after such an optimistic summer transfer period. Please continue to check TheWestHamWay.co.uk for the latest team news. West Ham: Fabianski, Zabaleta, Balbuena, Diop, Masuaku, Rice, Noble, Obiang, Yarmolenko, Arnautovic, Anderson.